When the month of January arrives, it signifies a new season and a new beginning. December is gone, marking a time full of celebration and great cheer for us all. To bring in this fresh, joyous moment, flowers are one of the best gifts to give to those dearest to you! They are also perfect for decorating your New Year's Day occasions. Aside from some of the other popular flowers to bring in the New Year with, the carnation is always a quiet favorite for us all. It is the birth flower for January. What makes the carnation so special is that It is January's only birth flower. When you give someone a birth flower, it gives your recipient a much deeper and richer experience with your endearing thoughtfulness. The carnation expresses love, fascination, and distinction, along with its' wide variety of colors have meaning as well. Light red carnations express admiration. Dark red carnations communicate deep love and affection, while white carnations symbolic pure love. Striped-colors symbolize a regret that a love cannot be shared and purple carnations show capriciousness. Also, carnations come in green, which make for great flowers on St. Patrick’s Day. The color that has the most historical and symbolic significance is the pink carnation. It's stated that according to Christian legend, carnations first appeared on Earth as Jesus carried the Cross. The Virgin Mary shed tears at Jesus’ plight, and carnations sprang up from where her tears fell. As a result, the pink carnation became the symbol of a mother’s undying love. In 1907, the pink carnation was chosen by Ann Jarvis as the emblem of Mother’s Day, now observed in the United States and Canada on the second Sunday in May. A red carnation may be worn if one’s mother is alive, and a white one if she has passed. If you are looking for the best of quality carnations in Southern California, you can count on SoCal Petals! This Los Angeles Florist has the superior floral arrangements that accents the carnation to make your January the most memorable ever. Here are just a few of our professional bouquets with a carnation theme that you will absolutely love. The Garden™ Centerpiece is a lovely way to bring bright, bold clusters of color to your reception. A collection of bouquets featuring a single type of flower, including peach carnations, pink carnations, pink spray roses, pistachio mini carnations, and green hydrangea are each set in small and medium silver julep cups to create a memorable display. This centerpiece include 5 bouquets, with each being approximately 5 to 7-inches in diameter. The FTD® Always True™ Bouquet blossoms with love's tender message. Rich red roses and carnations are accented with fuchsia mini carnations and lush greens arranged to perfection in a classic clear glass vase to create an exceptional way to convey your heart's most intimate wishes. Whether you are need of a Santa Ana Flower Delivery or a Huntington Beach Flower Delivery, SoCal Petals can have your flowers delivered in no time. Up to 3pm daily, our signature same-day delivery is available for you to thoroughly enjoy! Come and experience premium carnations, roses, peonies, and more when you order from SoCal Petals! During the holiday season, there are an array of occasions that we celebrate in December besides Christmas. From birthdays of loved ones to adoring your wonderful spouse for your anniversary, we still have those that are special in our lives to show just how much we care about them. When it comes to getting the best of the best with flowers, you can count on SoCal Petals to provide the most amazing bouquets in the Southern California area. We are a Long Beach Florist is known for its' superior, creative professional design floral arrangements. We have numerous floral selections, collections and more available, including our Best Sellers Collection! This collection showcases the stunning flowers that our customers are enjoying the most. If you're undecided, this collection can surely make your bouquet choice a lot easier. Here are some of our Best Sellers for you to order that you will absolutely love from SoCal Petals! Eloquent™ Bouquet by Vera Wang - The Vera Wang Collection has been known for a style and elegance that customers have come to love. The FTD® Eloquent™ Bouquet by Vera Wang is just one of those arrangements that can gracefully express your heart to the one your adore. This eye-catching arrangement includes beautiful lavender roses, purple stock, lavender mini carnations and clouds of light green hydrangea, all presented within a sophisticated clear glass champagne bucket vase. You will be thoroughly impressed with this timeless bouquet. The English Garden Bouquet - The English Garden Bouquet is a wonderful arrangement full of perfect mix of fresh flowers that communicate warmth and affection. It includes gorgeous hydrangeas, stock, roses and spray roses, all nested within a square glass cylinder. Your recipient will absolutely love this beautiful arrangement. #1 Florist Arrangement - With the #1 Florist Arrangement, Channel 11's Valerie Hoff awarded us with the #1 Arrangement from a local florist in Atlanta, which we offer in our Southern California area. This arrangement includes a wonderful mix of oriental lilies (for fragrance), red and pink roses, tulips and white monte casino aster in a simple clear vase. You can't go wrong with choosing this best selling bouquet! Wildflower Mix Bouquet - Everyone enjoys receiving the joy of sunflowers, which always will bring a smile to your loved one's face. This arrangement is comprised of not only sunflowers, but also a mix of other wildflowers as well. This bouquet includes sunflowers, queen annes lace, solidago, liatrice and limonium within a beautiful ceramic container. FanFare - The FanFare Bouquet has become popular for its' height and elegance. This beautiful cluster arrangement includes callas, snapdragons, tulips and hypericum berries with dark green leaf accents, all creatively designed within a modern tall glass square vase. This bouquet is the perfect floral decor as a centerpiece for your event or occasion, as well as surprising the one that you love. SoCal Petals has its' Best Sellers Collection available for you to order via phone or online anytime. If you place your order by 3pm daily, you can take advantage of our signature same-day delivery in the Southern California area. Whether you request a Los Angeles Flower Delivery or Villa Park Flower Delivery, SoCal Petals will have your flowers delivered fresh the same day. We can also create custom-designed arrangements that your recipient will enjoy as well. Our customer service staff is standing by to assist you with any questions about our stunning bouquets and meet all of your floral needs. Call SoCal Petals and receive the best in quality flowers today! When the fall arrives, there is so much beauty in nature, and we all love the wonderful colors in flowers that this time of the year brings. It's amazing how flowers can capture the essence of the season that we are in. Although it may be cold, the fall is a great season full of flowers to behold! What we have to offer is the Best Fall Flowers that you will find within our SoCal Petals Fall Collection . We have compiled an array of fall flower combinations to create the superior floral arrangements that you deserve. Pumpkin Spice - The Pumpkin Spice Bouquet is warm, little arrangement fitting for your work desk, or put a number of them on your tables for a large occasion. It is made up of creme roses, sunflowers, and other beautiful fall textures and colors full of autumn charm. All the flowers are nested within a sugar pumpkin with floral foam inside that holds the bouquet together. It keeps the bouquet fresh for up to a week and possibly longer. With this arrangement, make sure not to water the pumpkin excessively, which will cause it to rot faster. Natural Elegance Bouquet - The FTD® Natural Elegance™ Bouquet expresses the essence of the autumn months. It is comprised of the rich and vibrant colors that we absolutely love! This arrangement has Rust Asiatic lilies, orange roses, bronze traditional daisies, burgundy mini carnations, yellow chrysanthemums, and lush greens, all within a clear glass cylinder vase lined with red ti leaves for an elegant finish. This bouquet is perfect for Thanksgiving, as well as other occasions like getting well and birthdays. Fall Memories Bouquet - This is as beautiful and elegant of a fall bouquet as they come. It has the flowers that you would pick from an orchard in autumn time. It has Kale and yellow cottage yarrow, accompanied by other textures and seasonal flowers within a tall, cylinder glass vase. Use this arrangement for a table centerpiece or send it to that special someone during the fall season. Wildflower Mix Bouquet - Sunflowers are so enjoyed by everyone during this season and they will bring an immediate smile to your recipients' face. The Wildflower Mix Bouquet primarily includes sunflowers, along with queen annes lace, solidago, liatrice and limonium, all nested within a beautiful ceramic container. Enjoy sunflowers mixed with other complimenting wildflowers that create a wonderful autumn-colored arrangement. Abundant Harvest Basket - If you like baskets, the FTD® Abundant Harvest™ Basket contains Autumn's most majestic hues creating a short and beautiful arrangement. It includes dark orange Asiatic lilies, bi-colored orange roses, burgundy miniature carnations, fuchsia spray roses, peach hypericum berries and millet grass in a natural wood basket to celebrate this treasured harvest season. You can easily sit this basket on your work desk or place several around your home to create that feeling of fall for all of your family and guests. For the Best Flowers For Fall Occasions, no one compares to SoCal Petals! Our Fall Collection has the quality floral designs that you are looking for your precious events and occasions. From our Harvest Heartstrings Bouquet to our Orchid Rainbow Bouquet, SoCal Petals is the Manhattan Beach Florist that can meet all of your floral needs throughout the Southern California area. We only use the most seasonal and freshest flowers in all of our arrangements. With over 50 years of combined experience, our professional designers know how to make all of your favorite fall flowers come alive. SoCal Petals also daily provides our signature same-day delivery up to 3pm year round in the Southern California areas, convenient for customers that need flowers quickly. Whether you need a West Los Angeles Flower Delivery or Huntington Beach Flower Delivery, SoCal Petals can deliver for you in no time. For the best fall flowers during the holiday season, call SoCal Petals or order online today! When it comes to cut flowers, they can be the most beautiful bouquets that you experience. From timeless roses to elegant peonies, once you get a taste of continually having cut flowers, you don't desire anything less than the best. Yet, even these wonderful beauties of nature come to an end and wither away. "Only if they could last," we might say. If you really like having cut-flowers and you are open to becoming a planter, another option is to simply grow your own. It may seem a little overwhelming to begin planting your own flowers, however, there are an array of self-help tools to assist you with getting started. After you decide to grow your own cut-flowers, the next thing to decide is which ones should you grow. Below are just some of the best cut flowers to grow for your garden, and you'll be excited as you see spring up all of the amazing flowers you've been waiting for. Celosia - The celosia is an unusual cut flower that grows to 4 feet tall and produces crests, or combs, of large velvety flowers that are very long lasting after they are cut. This flower comes in yellow, red or pink. All celosias are tolerant of the hottest growing conditions and produce an abundance of seed. Gomphrena - This beautiful flower produces unusual ball-shaped flowers of violet, red or white. The flowers are borne atop wiry stems that are easy to arrange and the flowers are suitable for drying. Amaranth grows well in the field and tolerates heat, dry conditions and insects. Zinnia - The zinnia are very popular cut flowers because they are available in so many colors and interesting textures. Some zinnia plants produce small button type flowers and others produce flowers as big as 4 inches across. Zinnias are tolerant of all types of soils and thrive in warm conditions that would cause other flowering plants to fade. Sunflower - There's nothing like the sunflower growing in the autumn time. Sunflowers come in bright yellow with brown centers and vary in shades of bright yellow, red, brown, copper, orange and bi-colored petals. They also can have green centers also. If you are going to plant sunflowers after the 4th of July, select those that are what is called "day-length neutral", which means they can grow tall even while the day length shortens. Snapdragon - Snapdragons are are a good flower to grow in cooler climates and can be grown in the winter in the southern US. The best harvest of the snapdragon comes during the spring. They are great compliment flowers to your primary flowers within a floral bouquet. Snapdragons produce one large floral spike with multiple blooms or they can be pinched back to provide multiple smaller stems. Some varieties of snapdragons are more suitable as bedding plants because they are low-growing, so be sure to purchase seed or plants that are the cutting types such as the "Rocket" series. If you would rather just purchase your cut flowers, SoCal Petals has the premium floral arrangements just for you. We are a superior Huntington Beach Florist that is able to meet all of your standard and custom-design floral needs. From stunning floral bouquets to delicious gourmet chocolates, SoCal Petals does it all! Our professional designers have over 50 years of combined experience and take pride in delivering the highest level in customer satisfaction. We are a nationally-recognized Master Florist and considered a leader in the floral industry. You won't look any further once you experience a bouquet from SoCal Petals! We also can provide a Los Angeles Flower Delivery, a Venice Beach Flower Delivery or any delivery with the Southern California area. Up to 2pm daily, SoCal Petals delivers the same day fast! If you want the best, call SoCal Petals today! Even in the fall season, there are always the kind of beautiful flowers that bloom that you will adore. Flowers bloom all year round and it's only a matter of finding the best ones that fit specific to your event, occasion or if you enjoy doing your very own planting. If you are trying to decide what are the Best September Flowers to choose from that bloom within the month, here are a number of flowers and plants for you to choose from. Chrysanthemum - Chrysanthemums make up a large group of garden plants that generally start bloom periods in September. They grow 1 to 3 feet tall and have flowers in many colors and shapes. For example, the cultivar "Single Apricot" starts blooming in September. It continues to bloom through fall and has pale apricot flowers with yellow centers. The is a beautiful flower, fit for most occasions. Turtlehead Plant - The turtlehead plant is a great flower also. It grows about 2 feet tall and has pink-shaded, rose or white flowers that resemble the heads of turtles. They start blooming in August and then continue into October. Perennial Sunflower - The perennial sunflower is another herbaceous perennial that starts blooming in August and continues through September. It is native to parts of the US. Relative to the USDA, the sunflower grows year-round within USDA zones 4 through 8, making it easily accessible. Its' colors are daisy-like and bright orange-yellow. It is one of the most festive flowers during this time of the year. Hydrangea - Some plants, like the hydrangea, have a shrubby growth habit that begin in July or August and blooms through September. It's a large, spreading plant about 8 feet tall and 6 feet wide with pyramidal clusters of flowers. Hydrangeas come in white, blue, red, pink, light purple, and dark purple. Bluebeard Plant - The bluebeard plant begins flowering in late July and continues through September. It has clusters of dark blue flowers at the ends of branches covered in variegated, yellow and green leaves. It grows as high as 3 feet tall as well. Pansy - The common pansy is a good example of a plant that blooms in cool weather. They are a good choice for creating a fall-blooming garden to brighten up your flower bed late in the season. Although often grown in spring, you can plant pansies in late summer and its' flowers will appear from September through fall, yet will stop when the cold weather comes. White Snakeroot Plant - The white snakeroot plant delay their bloom until September, and then, continue until winter arrives. This wonderful flower has fluffy white flower clusters throughout fall, only stopping once winter arrives. If you are looking for superior cut-flower bouquets full of these flowers and more, there's no Hollywood Florist like SoCal Petals. We are a nationally-recognized Master Florist supplying quality flowers within the Southern California area. Our professional designers have over 50 years of combined experience and love their craft. Whether you need a Manhattan Beach Flower Delivery or Villa Park Flower Delivery, our signature flower same-day delivery available up to 3pm daily. We'll have your flowers delivered right to your front door in no time. For the best September flowers, call SoCal Petals today! As we enter into the months of fall, we can miss all of the bountiful blooming of flowers that comes within the summer time. However, it's great to know that every season supplies its' share of beautiful flowers, including the wonderful month of September. Yes, the Best Flowers of September are still available for your enjoyment. You can find a number of flowers to select from within this month, including its' birth flower known as the aster. This beloved flower symbolizes the feeling of powerful love. They are usually given to someone that has given birth during September, congratulating them on their new bundle of joy. Asters are also fitting for September weddings and birthday celebrations.Aster literally means star in the Greek. Also known as starworts, frost flowers or Michaelmas daisies, asters are native in certain areas in Asia, Africa, Europe, and America. This flower belongs to the sunflower family and is closely related to the chrysanthemum. It is perennial and grows easily in rich, moist soil. Gardeners see the aster as one of their favorites because they are easy to plant and grow in September. They can be planted in all zones as well. With it being the birth flower of September, the asters have also been used to commemorate 9/11. Its' use during this time of reflection and mourning affirms the symbolism and beauty of this honorable flower. Asters are also given on every September 4th. to show a sign of appreciation and gratitude to great teachers on Teacher's Day. One of the great things about this flower is that it loves to get lots of sun, and when it does, it creates a stunning bloom. It also comes in an array of bright colors, including various shades of pink, purple, white, lavender, blue, and red. It's yellow central disc on this flower is similar to daisies and you'll see that it remains the same regardless of the flower color you choose. If you are looking for beautiful, quality asters for your special occasion or event, no one compares to the superior flowers from SoCal Petals. We are a premium Bel-Air Florist that can meet all of your beautiful floral and assorted gift needs throughout the Southern California area. We a nationally-honored Master Florist and a proven leader within the floral industry. With over 50 years of combined experience, our professional designers take pride in their craft, offering you the authentic floral arrangements that your deserve. From breathtaking asters and gorgeous gerber daisies, to deep red roses and elegant calla lilies, you will receive nothing less than the best West Los Angeles flowers with SoCal Petals! We also offer custom design floral arrangements for you, which can be as original and authentic as they come. From $40 and above, our designers can create an exceptional bouquet just for you, according to the dollar value you would like to spend. Up to 3pm daily, our signature flower same-day delivery available as well for you to enjoy. You can place your order via phone or online and have them at your recipient's door step the same day! Whether you need a Los Angeles Flower Delivery or Orange County Flower Delivery, SoCal Petals does it all. For the best asters and more, call and experience SoCal Petals today! When it's time to get that special someone a gift for their precious occasion, nothing satisfies like a cut-flower arrangement. The beauty of red roses, the purity of white peonies, and the joy of sunflowers can surely bring a smile to their face. Cut-flowers have become a vital part of many holidays that we come to deeply love. No matter where you are, most of everyone is going to buy some flowers. One of the challenges of cut-flowers is the length of time the bouquet remains beautiful after you buy them. It does no good for the flowers to look good one day and be withered the next. You desire your recipient to enjoy them as long as possible. Below are some great tips on how to double lifespan of your floral arrangement. Use a clean vase. Two of the enemies of lasting flowers are bacteria and drought. Therefore, you want to begin with a clean vase. Scrub your vase with soap and hot water, rinse and fill with tap water. Then, add 1/4 teaspoon of liquid bleach per quart. This combats bacteria and fungus growth, yet at the same time, doesn't harm the flowers. Keep leaves from below the waterline. This is a great tip because sometimes we can just leave broken leaves in the water thinking it is doing no harm. Actually, submerged leaves rot, promoting bacteria and algae growth that shortens your flowers' life span. Condition the stems. Before plunging the stems into your vase of water, cut the stems at a forty-five-degree angle to allow for the greatest amount of water to be absorbed. It conditions the flowers to absorb new water. Change the water every day. This keeps the water for your flowers free of bacteria. Even with all these tips to to make your cut-flowers last, it always helps to have most freshest and high quality flowers to begin with. You can turn to no other than SoCal Petals for those premium cut-flowers that you are panting for! As a nationally-recognized Master Florist, SoCalPetals has an array of wonderful, modern bouquet designs and styles that you will absolutely love. Our professional designers have over 50 years of combined experience and have perfected their craft to deliver exceptional floral arrangements each and every time. The Los Angeles Florist prides itself on not only creating beautiful floral arrangements, but also making sure that they are delivered fast. We offer same-day delivery up to 3pm for only $11.99 and next-day delivery for $9.99. With managing and delivering all of our bouquets, we position ourselves to have ownership of all deliveries to assure that your bouquet arrives fresh and on time. Our same-day delivery is available throughout the Los Angeles and Orange County area, therefore we can provide you with a Irvine Flower Delivery or West Los Angeles Flower Delivery right to your front door. 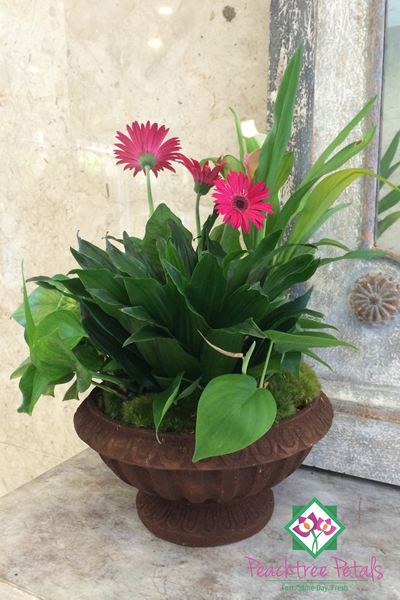 SoCal Petals can custom-design your arrangement as well. Whether you place your order online or you call to share what you're looking for, just tell us what you need and our skilled designers will create a bouquet according to your dollar value. From $40 and up, SoCal Petals can satisfy with an original, unique floral arrangement with all the flowers your recipients enjoys! With the tips the double the life span of the bouquet, they can have them a lot longer also. SoCal Petals wants to be a part of your moments and help them last. For your flowers and assorted gifts, call SoCal Petals today! If you are looking at doing some pot planting in late August, there are still some of the Best Los Angeles Flowers this summer to enjoy. The gladiolus is the birth flower of August, and it blooms within these last months of this beautiful season. The flower symbolizes sincerity, strength of character, and generosity. It grows as a single, wonderful flower that can have more than two dozen blooms with fancy ruffled edges. You'll have many color choices for the gladiolus, including white, yellow, hot pink, purple, and more. With all of its' meaning and colors, the gladiolus is a great flower to plant. Gladiolas, also known as sword lilies, are suitable for both ground and container planting. They grow from corms similar to bulbs with exception of the bud that extends from the top of the flower. Gladiola pot planting is easy and very simple. All you'll need is potting soil, play sand, 12-16 inch containers, and your gladiolus corms. Next, just follows these instructions to grow your glads and you'll be enjoying their beauty in no time. Fill the containers, with a damp mixture of 50 percent potting soil and 50 percent play sand, in the early fall. Fill the container ¾ full with the soil and sand mixture. Make sure that the containers have drainage holes in the bottom. Dig holes in the soil mixture for the gladiolus corms. Dig the holes 6 inches deep and 6 inches apart. Place the corms in the holes with the flat side down, bud side up. Place the containers in a spare refrigerator, basement or root cellar. The storage area should have a constant temperature of approximately 45 degrees. Light is not a necessity during this dormancy period. Bring the pots outdoors in the spring when the gladiolus shoots begin to pop up through the soil. Place the pots in a warm, sunny area. Water the gladiolas by soaking the soil with a watering bucket. Provide enough water that it seeps through the soil and out the drainage holes. Keep the soil moist at all times, watering whenever necessary. Allow the gladiolas to die back in the fall. Wait for the leaves to turn yellow and cut the foliage down the soil line. Dig up the corms and fill the pots with a new batch of potting mix to repeat the dormancy process. Enjoy your gladiolas, not only potted, but also you can get the best hand-crafted floral arrangements from SoCal Petals. From gladiolas and hydrangeas, to peonies and stargazer lilies, SoCal Petals has all of the floral choices you're looking for. This Irvine Florist has designers with over 50 years of combined experience and love designing superior bouquets. As an FTD Master Florist, we have a proven track record of delivering premium, fresh flowers beyond our customers' expectations each and every time. Whether you are in need of a Lake Forest Flower Delivery or Villa Park Flower Delivery, SoCal Petals can deliver your flowers the same day order them. Up to 3pm daily, our uniformed delivery professionals will bring your floral bouquet right to your front door. In Southern California, you can have the best floral arrangements, assorted gifts and more. Call us or order online from SoCal Petals your favorite flowers today! Gardening is so good to do professionally and just as a relaxing hobby. You can choose from many types, but there's nothing like a pleasant vegetable garden to gather and eat all of your very own fine vegetables. These gardens can be complimented with planted flowers to aid and protect your vegetable growth. It's amazing how much flowers can benefit your vegetable garden. Flowers will entice more bees and pollinators into your garden, especially those that attract with their colors, such as white and yellow flowers. They also can repel pests, which is the wrong kind of company for your garden to have. There's no guarantee that every flower will repel them, but it is worth experimenting. There are so many flowers to choose from, yet here are just a few of of the best flowers to help protect your vegetable garden! Sunflowers - You may not have known that Sunflowers are great for vegetable gardens, but they are perfect for them. They actually have an abundance of nectar to attract pollinators. They are also excellent for climbing plants. Sunflowers do attract squirrels,but a coarse leaved vegetable like squash planted beneath them, will help deter animals. Marigolds - Marigolds are great flowers for vegetable gardens because they deter pests both above and below ground. You can simply create a ring of Marigolds around your vegetable garden and watch them work. They repel squash bugs, tomato hornworms, thrips, and whiteflies. This amazing flower also exudes a chemical that kills root nematodes in the soil. Nematodes can be dealt with using Marigolds as well. Marigolds will need to be planted a year in advance, and leave the roots in the soil when the season ends. Lavender - Lavenders are beautiful flowers and they emanate a wonderful fragrance that is a repellent for several pests in a vegetable garden. It prevents deer and mice because they don't like them. It decreases the amount of ticks and moths find the Lavender's scent offensive. You probably know that deer avoid it, but there are other insects and animals that stay clear away from Lavenders also. You can find these flowers and more at SoCal Petals for your garden. This new Long Beach Florist can provide you with the freshest and highest of quality flowers Southern California area. For stunning floral arrangements, we are a nationally-recognized Master Florist and our professional designers have over 50 years of combined floral experience, aiming to always meet and exceed our customer's expectations. Need your flowers and floral arrangements fast? SoCal Petals offers our signature same-day delivery throughout Southern California. If you are celebrating a birthday, anniversary or holiday, SoCal Petals delivers flowers up to 3pm daily. Your wonderful floral bouquet and assorted gifts can be at your front door within hours. Whether you need an Irvine Flower Delivery or Venice Beach Flower Delivery, SoCal Petals does it all! Visit us at www.socalpetals.com and experience a SoCal Petals floral arrangement today! The passing of someone dear creates the necessity for those in mourning to have a strong support system of friends and family. This support system, coupled with the traditional rituals and customs around death, like funerals, are integral parts of the grieving process according to grief counselors. It is often difficult to know just how to support someone in their time of loss and need. This can be especially difficult as modern approaches to burial rites and practices emerge and eclipse long-standing traditions such as wakes, funerals and grave burials. Sympathy flowers are still a wonderful choice to honor those who have passed and support the bereaved. Historically, sympathy flowers are sent to funeral homes, churches, or grave sites for display during calling hours or wakes. Today, with new approaches to burial services emerging, this approach may not always be an option. Etiquette experts recommend sending sympathy flowers to cremation or memorial services if traditional viewings and funerals are not held, but suggest sending your condolences to the homes of the bereaved in the event there is not a ceremony. For cremations and memorial services, arrangements such as long garland, wreaths, flowers in baskets, or sprays can beautifully accent urns or caskets. Loose flowers or petals and sympathy wreaths are lovely options for paying respects if the deceased has requested ashes to be scattered throughout water. Live plants are also an emerging trend in sympathy flowers as they give the grieving loved ones something to take home with them and remember the life of their loved one rather than their death. When the bereaved is ready, these live plants can even be turned into a small memorial garden to enjoy for years to come as opposed to a stem arrangement, which has a limited life. We have all been in a position when we find out of the passing of someone too late to send flowers for the funeral or service, or maybe at the time we were simply unsure of how to proceed given the delicate nature of the situation, however, etiquette rules dictate it is still appropriate to send sympathy flowers and gifts to the homes of the grieving up to one month after the service. In fact, it is likely the outpouring of support and the emotions of the bereaved will be the highest during the time closest to the service, and so it might even be welcomed to receive condolences and an encouraging note after things begin to subside and the bereaved attempt to return to normal. When selecting a sympathy arrangement to send, you’ll want yours to stand out and be representative of either the life and legacy of the deceased in memoriam, or truly innovative of encouragement and love for the recipient. To do that, it is important to work closely with experienced florists like those at Los Angeles florist, SoCal Petals. With over 20 years of combined industry experience, the florists at SoCal Petals have worked with many people to create wonderful sympathy arrangements that send the respect and condolences you wish to convey during this difficult time. SoCal Petals has a variety of bouquets, sprays, wreaths, casket adornments, and more available. If you are unable to find exactly what you need among the variety in SoCal Petals’ extensive sympathy and funeral flowers collection, our talented FTD Master Florists are happy to work with you to create just the right arrangement for the viewing, wake, funeral, memorial service, or just to send to a grieving loved one several weeks after the service to remind them you’re still thinking of them. SoCal Petals also offers convenient flat-rate same and next day Irvine flower delivery. Please view our sympathy and funeral collection online to place an order or call us at 888.212.0038 to speak with a florist to create exactly what you need. The month of June marks the official start of summer, and this season is the perfect time to start those gardening projects you’ve been thinking of all winter long. June 6th is National Gardening Exercise Day, a day recognized by “aerobic gardeners” all over America as a fun way to flex more than just their green thumbs. Gardening has proven health benefits like improved muscle flexibility, improved cardiovascular health, and getting outside in the sunshine and working with your hands exposes you to natural vitamin D, which is a great way to boost your overall mood! According to Jeffrey Restuccio, a gardening exercise expert consulted by Weight Watchers, many gardening/yard work activities have similar cardio benefits to other calorie burning activities. For example, trimming shrubs or trees using a power cutter can use just as much energy as walking at a moderate pace, and raking; planting seeds and shrubs can burn through as much energy as you would if you were to bike at a leisurely pace. Switching up your regular exercise routine on this June 6th holiday in favor of this “aerobic gardening” can be a fun way to get your garden and yard looking pristine, but a great garden takes a lot of patience and dedication. For more instant gratification, let SoCal Petals, provide you with premium plants delivered right to your door. The FTD recognized florist has a variety of plants perfect to bring the garden indoors, or to plant when the timing is right for you. One of Peachtree’s more popular foliage displays is the Schefflera Arboricola, or Dwarf Umbrella Tree. Arriving in a modern, round, graphite container, this lush and vibrant 10’ in diameter shrub is perfect for indoors or outdoors. The Classic Planter is another superb choice for that instant garden feel. This classic ceramic planter is perfect for a patio or sunroom without having to wait for the work from your green thumb on National Gardening Exercise Day to take hold. This arrangement is unique to the SoCal Petals and is created specifically for you at time of order based upon the freshest and highest quality foliage and blooms available at the time. When you place your order, you will be able to discuss with the talented florists about the availability and arrangement of the best greenery for this planter. Since opening its doors, SoCal Petals has quickly established itself as California’s premier flower shop. With free Los Angeles flower delivery, commitment to excellence in both customer service and quality of product, SoCal Petals is perfect for all of your summer foliage needs whether it be to add a bit of greenery indoors or on your patio, you can place you can receive your order with easy, same-day delivery service and be enjoying it right away while waiting to enjoy the added fruits of your labor from National Gardening Exercise Day. Orders can be made online through Socal Petals’ user friendly website, by phone 888.212.0038, or stop by the California Flower flower shop to place an order in person and take advantage of daily pickup specials. WeightWatchers.com, "Get a Garden Workout." Web. 2 Jun. 2015. There is nothing like summertime, when all of the brightness of the sun and the beauty of mother nature is in full bloom. It's a wonderful time to travel and explore the world with the ones you love. It is also a great to celebrate an enormous array of occasions and events that you will always remember. From birthday celebrations to graduation ceremonies, we all will experience the joy of summer! With all of your treasured events, it's great to know that the gift of flowers are available to make that loved one's moment even more special. Now that it is summer, the Best June Flowers are here, ready and waiting to absolutely take your breathe away. If you are having a June event, or desiring to surprise your dear friend with a stunning floral arrangement, here are some of the most seasonal and popular flowers in June just for you! Hydrangea - The hydrangea is a wonderful and unique flower all of its' own. Women really adore the hydrangea. Each individual flower is small; however, they come in bunches at the end of each stem, which make for a bountiful-look, especially within a bouquet. Hydrangeas can be found primarily in white, yet also blue, red, purple, and pink. It is a very versatile flower, making it a great choice for wedding flowers and many other memorable occasions. Chrysanthemum - Everyone loves chrysanthemums, either for a primary flower or to compliment other flowers for an occasion. Surprisingly, Chrysanthemums, also called "mums", are widely known as the most popular flowers next to roses. One reason is because it belongs to the Asteraceae family, which is one of the largest families of flowering plants. As a result, there are of variety of mums that people enjoy. Mums come in a wide range of colors, including yellow and gold, white, pink, orange, maroon, bronze, deep red, violet and purple. Some even mix between two or more colors. You will absolutely adore this flower! Calla Lily - The cala lily is one of most beloved flowers in the world, known for its' elegant form. It signifies beauty, magnificence, in addition to other meanings like purity and wealth. Calla lilies come a variety of colors, such as white, pink, yellow, purple, and shades of green. The cala is one of the more expensive flowers, but it is well worth it to use for your wedding, anniversary or corporate celebration. When you are in need of high-quality, fresh flowers in June, no one compares to SoCal Petals! As a superior Los Angeles Florist, our design team has over 50 years of combined experience in creating the most stunning floral arrangements. We have a wide range of floral collections for you to choose from this summer, from our SoCal Petal Originals to our luxury flower bouquets. We also take pride in providing our signature same-day delivery within the Los Angeles and Orange County areas. SoCal Petals can deliver any of our beautiful floral bouquets and assorted gifts to that special someone the same day you place your order. Therefore, your Irvine Flower Delivery or Bel-Air Flower Delivery can be performed in no time! You will receive nothing less than the best with SoCal Petals.